Product Description: less text Spoil a loved one with this sweet gift! White Gold Lindt Truffles (2), Coconut Lindt Truffles (4), 52% Dark Lindt Truffles (3), and Almond Lindt Truffles (3) are nestled amongst coloured tissue paper in a polka dot box, with an adorable green frog teddy and colourful butterfly balloon. A ribbon with pin diamante is also included, making this one special gift! 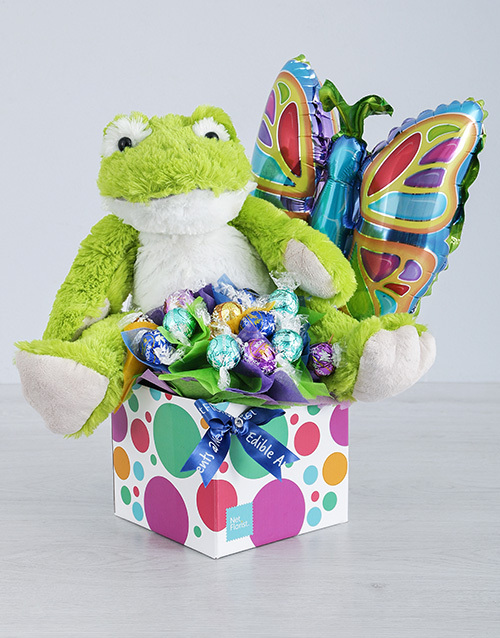 Get this Green Froggy Lindt And Butterfly Balloon Box delivered with NetFlorist.